Geospatial data is used by organizations, consultants, and researchers for mapping and analyzing information of a geographical area. The most commonly requested data can be downloaded from the table below in groups as geodatabases (GDB) or individually as shapefiles (SHP). To download, right click the link and choose 'Save Link As'. Once downloaded and unzipped, mapping software such as ArcGIS, ArcGIS Earth, QGIS, or Google Earth Pro is required to view the contents of the folder. ArcGIS Earth and Google Earth Pro are free desktop applications which allows users to import and view shapefiles. Please note, our data is not guaranteed to be survey accurate. Zoning, permitting or information requests regarding property can be addressed by contacting the Land Use Desk. For inquiries about the utility data below, please contact the Utilities Department. Demographic, crime, and additional tabular data is available on Bellevue's Demographic Profile and the Open Data Portal. 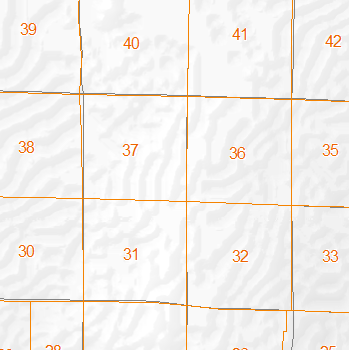 If you cannot find the GIS dataset you are looking for, we may be able to accommodate a standard request. 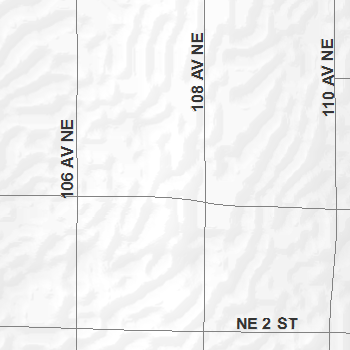 Boundaries and names of areas annexed to the City of Bellevue. Boundaries and names of cities in northwestern King County. Boundaries of elementary school attendance areas within Bellevue School District. 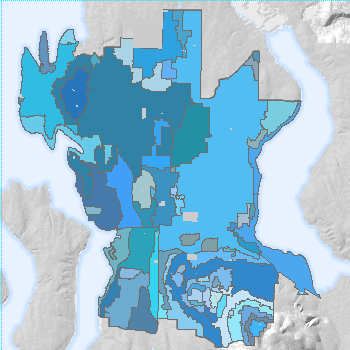 Boundaries of high school attendance areas within the Bellevue School District. Boundaries of middle school attendance areas within the Bellevue School District. 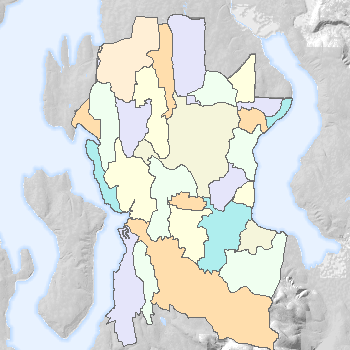 Boundaries of the school district within the region - Bellevue, Issaquah, Lake Washington, and Renton. Location and names of schools within the Bellevue area and the district in which they reside. Parcel boundaries and names of schools within the Bellevue area. 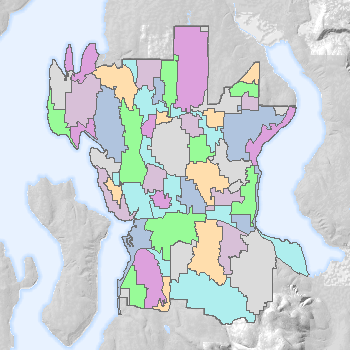 Boundaries of zipcodes in the Bellevue region. Boundaries of abandoned coal mines located in the Bellevue area. 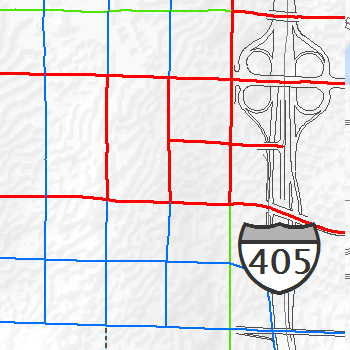 Boundaries of the 100 year floodplains for major streams in the Bellevue area, as determined by the Federal Emergency Management Agency (FEMA). This data was prepared as part of an Infiltration Infeasibility Analysis and Technical Report, prepared for the City of Bellevue Utilities Department by Associated Earth Sciences, Inc., on April 4, 2016. Boundaries and names of lakes in the Bellevue area. 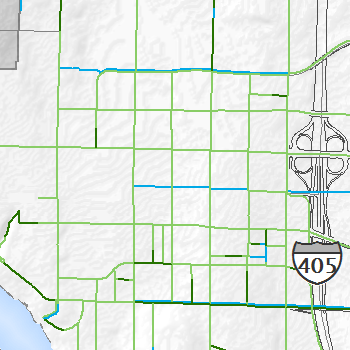 Sustainability areas most at risk of liquefaction in case of an earthquake in the Bellevue Area. 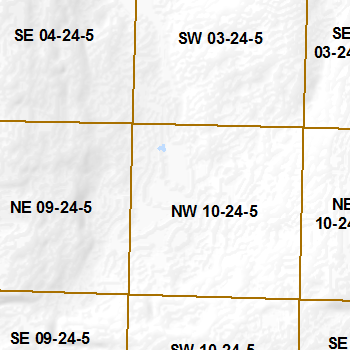 Boundaries of the soil types found in the Bellevue area. Locations and names of major streams in the Bellevue area. Orthophoto (aerial photograph) tile index. This is used as a reference for the downloadable set of orthophotos listed below. Orthophoto (aerial photograph) tile index. This is used as a reference for a requested quatersection map. 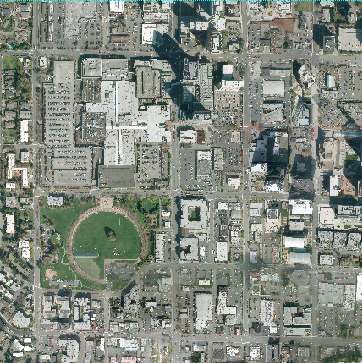 Aerial imagery of the Entire City of Bellevue mapping area organized by tile. 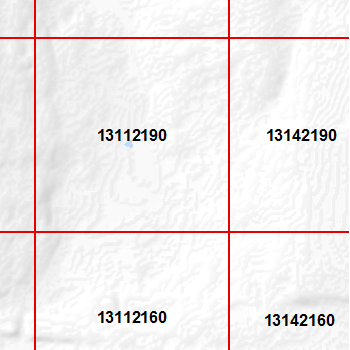 To determine which tile(s) you need, please reference the orthophoto index shapefile above or the index map on our PDF Maps page. High-speed internet connection required to download. Boundaries of the Downtown design districts for Bellevue. Boundary of the East Bellevue Community Council. 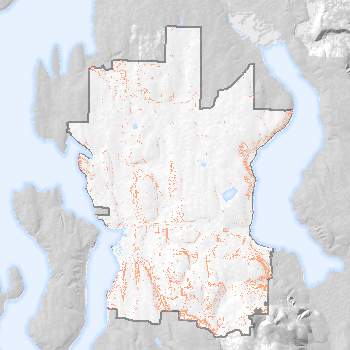 Boundaries of land use designations for the comprehensive plan areas of Bellevue. Land use designations provide guidance about the approved land use intensity for each area. Locations of Bellevue's multi-family transition areas. These areas contain restrictions on development and are meant to serve as buffers between multi-family zones and zones intended for more intensive uses such as industrial or commercial. 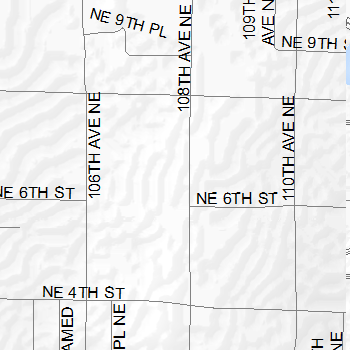 Boundaries and names of neighborhood associations within Bellevue. Boundaries and names of Neighborhood Enhancement Program/Neighborhood Liaison areas within Bellevue. 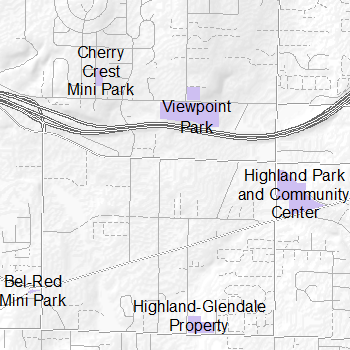 Locations of Bellevue's single-family transition areas. These areas contain restrictions on development and are meant to serve as buffers between single-family zones and zones intended for more intensive uses such as industrial or commercial. Boundaries and names of the planning subareas in the Bellevue area. 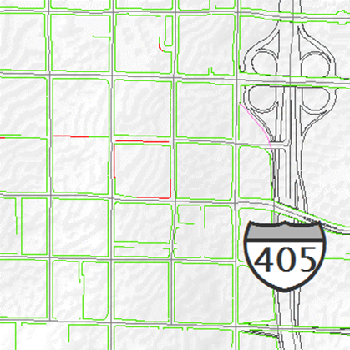 Urban growth boundary defined by the Growth Management Act (GMA) for the area of Bellevue. 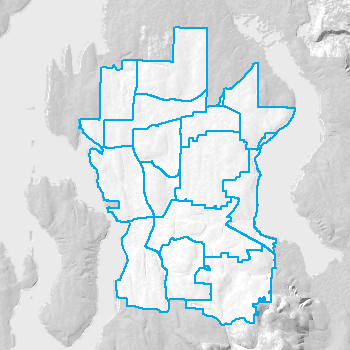 Boundaries of Bellevue's zoning areas. 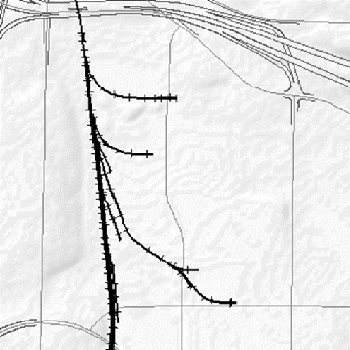 Outlines of building in the Bellevue area. Locations and names of various city, county, state, federal, and private facilities in the Bellevue area. Boundaries and King County parcel identification (KCPARCEL) numbers for the Bellevue area; Bellevue, Beaux Arts, Clyde Hill, Hunt's Point, Medina, Newcastle, Yarrow Point, southern Kirkland, Redmond, northern Renton, and unincorporated King County. 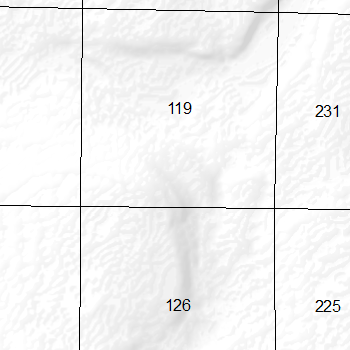 Tile index of the Public Land Survey System sections. 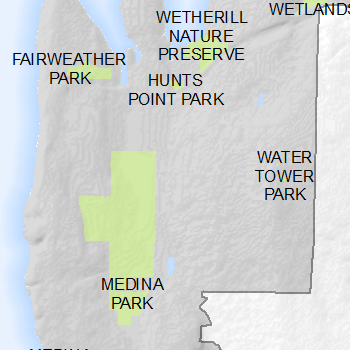 Boundaries and names of various facilities in the Bellevue area. Generalized cover classes within park areas such as forest cover, hard surfaces, and open water. 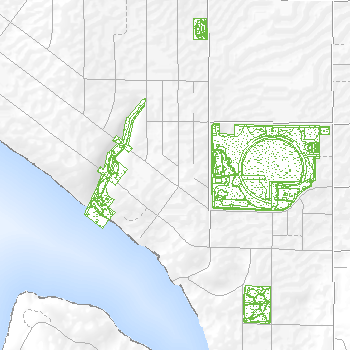 Boundaries and names of non-City of Bellevue owned parks in the Bellevue area. 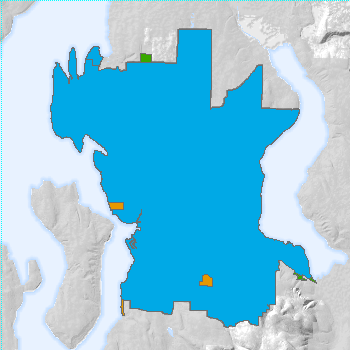 Boundaries and names for each parcel of park land in Bellevue and Redmond that are owned by the City of Bellevue. 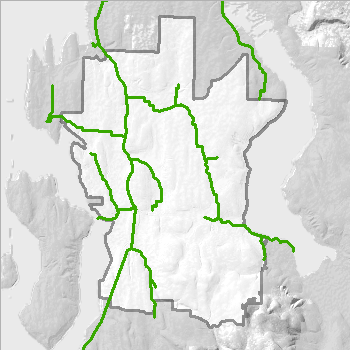 Boundaries and names of each park in Bellevue and Redmond owned by the City of Bellevue. Locations and names of trails in the Bellevue area. Boundaries of features such as medians, parking strips, cover types (i.e. planting beds, tree wells, or hard surfaces). Boundaries and identifying numbers for fire station districts and subdistricts of the Bellevue Fire Department. Locations and designating numbers for stations of the Bellevue Fire Department. Boundaries and identifying numbers of the districts and subdistricts of the Bellevue Police Department. Locations and names for substations of the Bellevue Police Department. 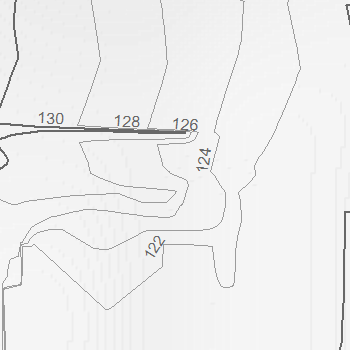 Locations and elevations of topographical contours (using a 2-foot interval) for the entire Bellevue area. 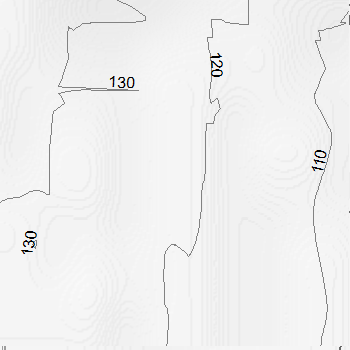 Locations and elevations of topographical contours (using a 10-foot interval) for the entire Bellevue area. 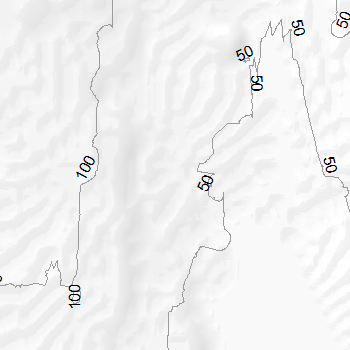 Locations and elevations of topographical contours (using a 50-foot interval) for the entire Bellevue area. 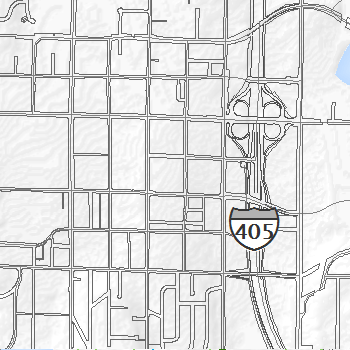 Locations of slopes over 40% and GE 1,000 square feet in the City of Bellevue. Locations and names of arterial streets in Bellevue as designated in Bellevue's Comprehensive Plan. 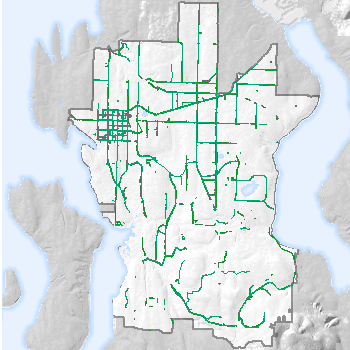 Existing and proposed bicycle facilities in Bellevue as defined by the Pedestrian and Bicycle Plan. Locations and names of priority streets to be used during an emergency scenario, classified by day, night, or both. 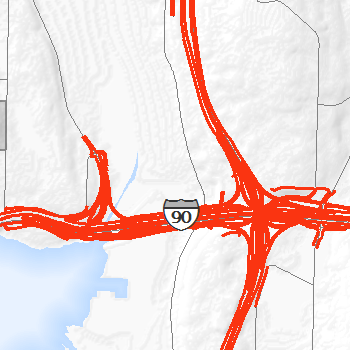 Locations of freeways in and near Bellevue, including SR-520, I-90, and I-405. Locations and identification numbers for Bellevue's transportation Impact Fee Zones that are based on trip patterns and land use distribution. It is assumed that each new trip generated by a new land use will impact the network. Existing and proposed pedestrian facilities, including sidewalks and trails. Locations of public right-of-way routes in the Bellevue area. 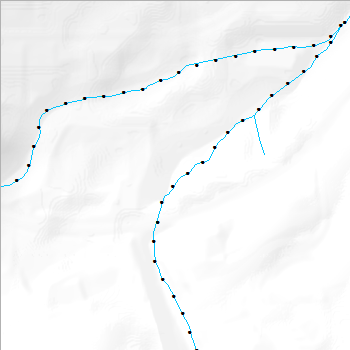 Locations of railroad tracks in the Bellevue area. Location and information of sidewalks in the Bellevue area. Locations of streets to be plowed in case of a snow event. Snow plow routes are given a level of priority and are assigned by the utilities streets maintenance group. Locations and names of streets in the Bellevue area including those in Beaux Arts, Clyde Hill. Hunts Point, Medina, and Yarrow Point. 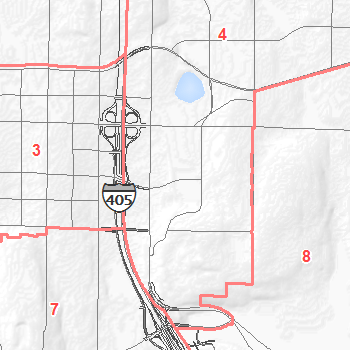 Locations and identifying numbers of transportation analysis zones in the Bellevue area. 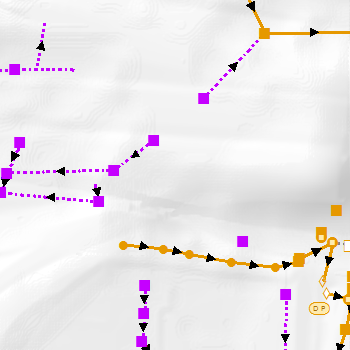 TAZs are primarily used for the collection of land use data and the calculation of trip origins and destinations. 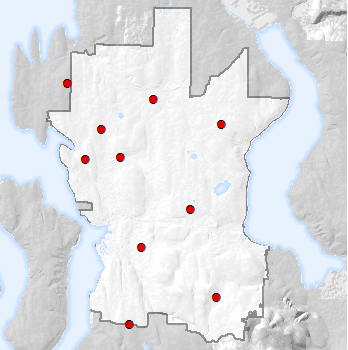 Locations of rain gauges that collect and measure rainfall in the Bellevue service area. Locations of stream stations at 50 foot intervals. Locations and designations for the cells of the utilities grid directory for the Bellevue service area. 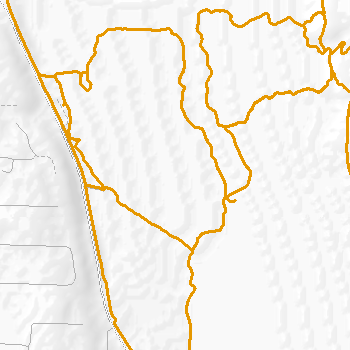 Boundaries of the water and wastewater service area. 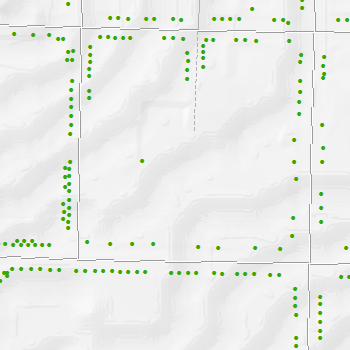 Locations of storm drainage infrastructure data in the Bellevue service area. Individual shapefiles include: access points, inlets, discharge points, fittings, valves, weirs, clean outs, detention vaults and ponds, pipes, open drains, casings, repairs, and culverts. Boundaries of storm drainage basins and areas in the Bellevue service area. 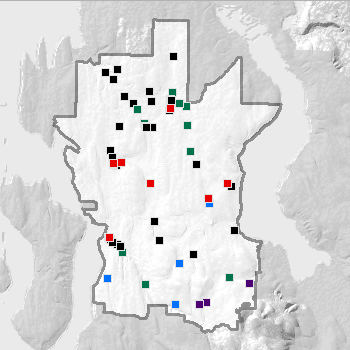 Locations of drainage sites that retain excess rain and ground water in the Bellevue service area. 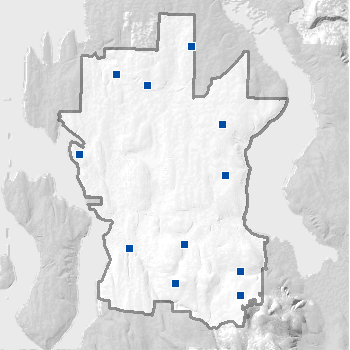 Locations of wastewater infrastructure data in the Bellevue service area. Individual shapefiles include: inlets, fittings, discharge points, valves, clean outs, stations, manholes, pipes, casings, vaults, and repairs. 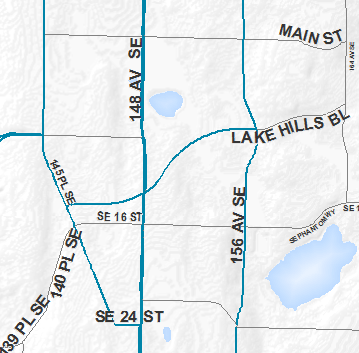 Boundaries of wastewater basins in the Bellevue service area. 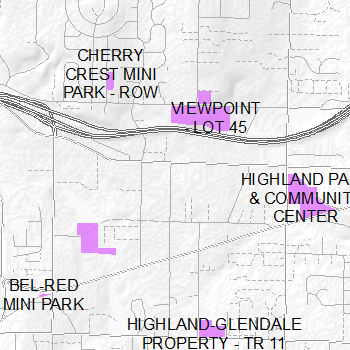 Locations of pressurized pipes carrying sewage in the Bellevue service area. 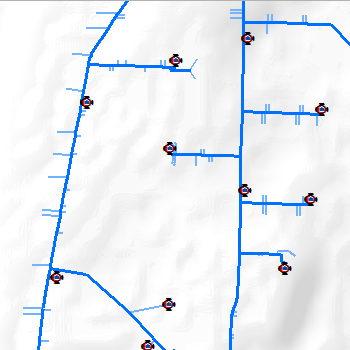 Locations of water infrastructure data in the Bellevue service area. Individual shapefiles include: meters, fittings, valves, fire flow, hydrants, interties, pumps, inlet stations, reservoirs, sampling stations, pipes, casings, vaults, and structures. Data in high-security areas has been redacted. 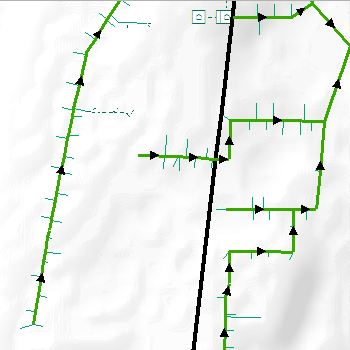 Boundaries of sections inside the Bellevue water service area that have been determined primarily by elevation. Disclaimer: The information on this site is a geographic representation derived from the City of Bellevue Geographic Information System. The City of Bellevue does not guarantee that the information on this site is accurate or complete. This data is provided on an "as is" basis and disclaims all warranties, express or implied, including but not limited to warranties of merchantability, fitness for a particular purpose and non-infringement. 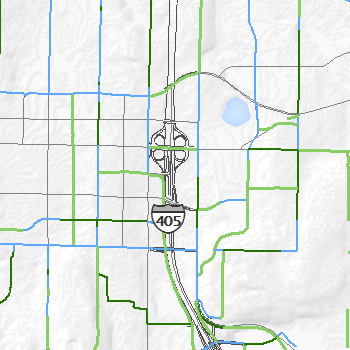 Any commercial use or sale of this data or portions thereof, is prohibited without express written authorization by the City of Bellevue. The City of Bellevue is not responsible for any damages arising from the use of information on this site. Use of this map is at user's risk. Users should verify the information before making project commitments.